Bernard "Bernie" Sanders is the junior United States Senator from Vermont, elected on November 7, 2006. 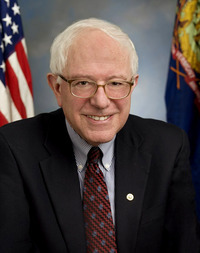 Before becoming Senator, Sanders represented Vermont's at-large district in the United States House of Representatives for 16 years. Sanders also served as mayor of Burlington, Vermont from 1981 through 1989. Bernie Sanders isn't a Goodreads Author (yet), but he does have a blog, so here are some recent posts imported from his feed. Our nation pays - by far - the highest prices in the world for prescription drugs. As a result of these prices, nearly one in five Americans cannot afford to fill their prescriptions. At what point do we say our tax system, our publicly funded research and our patent system are not serving the public interest? Conscience of a Progressive: The Best Speeches of Bernie Sanders, In Congress, 1991-2015, Abridged and Annotated. Illustrated. Who would you like to see win the 2020 United States presidential election? Is this you? Let us know. If not, help out and invite Bernie to Goodreads.